June 15 , by Mardi Robyn. I remember as a little girl browsing the craft aisle at the local store with my Mama and seeing the rows of embroidery thread in what looked like an endless variety of colors and being fascinated but the thin, yet sturdy thread. Fast forward several years to today and the colors still fascinate me. 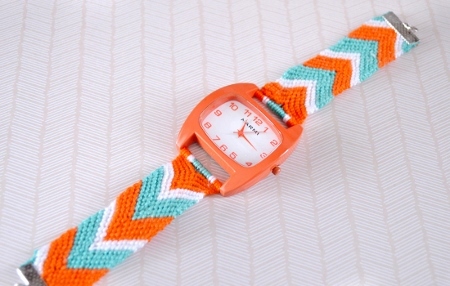 It amazes me how someone can use embroidery thread and make pretty friendship bracelets or any other type of jewelry that can be imagined, like this Friendship Bracelet Watch by Allison from “Dream a Little Bigger.” She uses pretty, bright colors orange, mint green, and white and fashions the thread into a chevron design. Allison does a wonderful job providing detailed instructions with photographs so you can be sure to see each step to be taken in making a trendy Friendship Bracelet Watch. Think of the color possibilities. You can watches to match any outfit for yourself, family, and friends. Check out the tutorial and be inspired.